This morning I was struck, listening to Europe 1 to hear people in Syria, including Kurds, saying that they welcomed bombs on Assad’s military resources, though they doubted that the present air strikes would have any real effect. Labour calls for the attack on Douma to be “fully investigated”. That sounds unarguable. But then what? Jeremy Corbyn issued the same call after the chemical attack that killed at least 74 at Khan Sheikhoun a year ago: demanding there be a “UN investigation and those responsible be held to account”. The UN duly investigated and in October concluded unambiguously that the Assad regime had used sarin gas. But Corbyn greeted that verdict with silence. So unless there’s a plan for action once guilt is established, demanding an investigation sounds a lot like an excuse to do nothing in the hope that soon we’ll all be talking about something else. And then, the nature of the Syrian civil war and the anti-war movement comes up…. La Ghouta orientale, tombeau de la révolution syrienne (Le Monde yesterday). Les exactions des insurgés et le siège cruel imposé par le régime de Bachar Al-Assad ont provoqué la chute de cette ancienne oasis agricole, située aux portes de la capitale Damas. The abuses by the insurgents and the Assad regimes cruel siege have brought down the old agricultural oasis located at the doors of Damascus, the Syrian capital. This has to be read in full. The Anti-Imperialism of Idiots. April 14, 2018 by Leila Al Shami. A British Syrian whose been involved in human rights and social justice struggles in Syria and elsewhere in the Middle East since 2000. I was a founding member of Tahrir-ICN a network connecting anti-authoritarian struggles across the Middle East, North Africa and Europe. These paragraphs are particularly important. The first thing to note from the three major mobilisations of the western ‘anti-war’ left is that they have little to do with ending the war. More than half a million Syrians have been killed since 2011. The vast majority of civilian deaths have been through the use of conventional weapons and 94 per cent of these victims were killed by the Syrian-Russian-Iranian alliance. There is no outrage or concern feigned for this war, which followed the regime’s brutal crackdown on peaceful, pro-democracy demonstrators. There’s no outrage when barrel bombs, chemical weapons and napalm are dropped on democratically self-organized communities or target hospitals and rescue workers. Civilians are expendable; the military capabilities of a genocidal, fascist regime are not. In fact the slogan ‘Hands off Syria’ really means ‘Hands off Assad’ and support is often given for Russia’s military intervention. This was evident yesterday at a demonstration organized by Stop the War UK where a number of regime and Russian flags were shamefully on display. From the French left (notably Jean-Luc Mélenchon) to parts of the right and the far-right (including Philpott’s split from Marine Le Pen’s party) there is opposition to the air-strikes. Le chef de file de la France Insoumise, comme une partie de la droite et de l’extrême-droite a vivement critiqué samedi les frappes menées contre le régime syrien Libération. they will not force Assad out of power. Indeed it is not clear that the imperialist powers want to see an end to this barbarous regime and certainly they are opposed to self-determination for the people of Syria. The entire Labour Party must back Corbyn in his opposition to more bombing and war and we should make sure that party banners are highly visible at demonstrations opposing military intervention. We need to be demanding an end to the war and all foreign interventions, including those on behalf of Assad from Russia, Iran and Hezbollah. We must continue to offer political and material support to the secular and democratic opponents of the dictatorship and Labour must call on European governments to offer sanctuary to Syrian refugees. 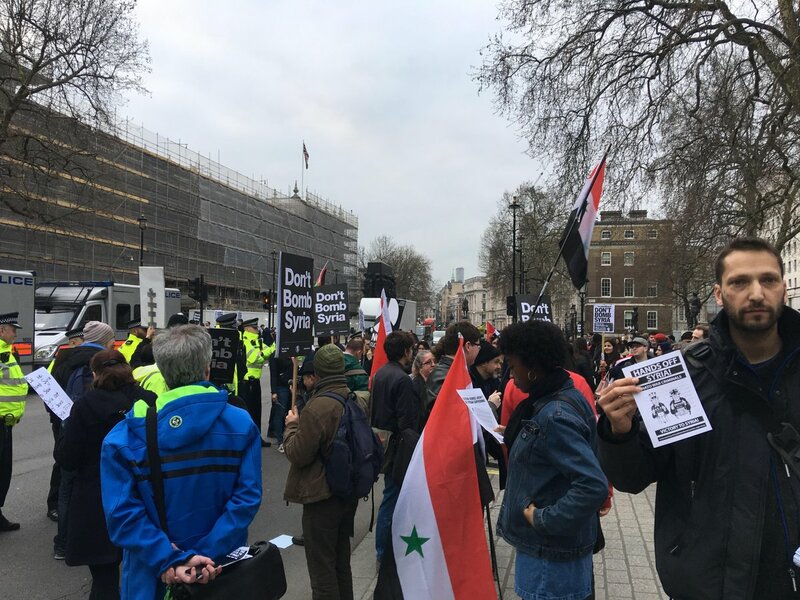 – "Going to war in Syria is the wrong thing to do"
– "This war is wrong because it's expensive"
– "We don't want regime change because it would destabilise things"
– "It would be fine if parliament voted"
– "There were no chemical attacks"
« Oppose the Attacks on Syria, Oppose Marching with Assad Supporters.